Can a megalopolis notorious for smog and traffic become known for vertical gardens and green design? Mexico City’s reputation for air pollution and filth is slowly receding as the city’s politicians and citizens transform their city. One nonprofit organization pushing the boundaries of art and sustainability is VERDMX - so far they've installed three vertical gardens throughout Mexico City that figuratively and literally clean and green this city of 8.8 million people. VERDMX‘ eco-sculptures serve as both artworks and oxygen replenishers. VERDMX’s work, sponsored by Nissan, serves as an example of how nonprofit organizations, businesses and local governments are turning Mexico City into an urban sustainability model to which other developing countries look for inspiration. The organization would like to scale the project throughout more of Mexico. For VERDMX, the benefits of vertical gardens make them an easy sell. Each square meter (10.8 square feet) generates a year’s supply of oxygen for one person while removing 130 grams of particulates in the air. A vertical garden on a facade four stories high can filter 40 tons of greenhouse gasses and process 33 pounds (15 kilograms) of harmful heavy metals. 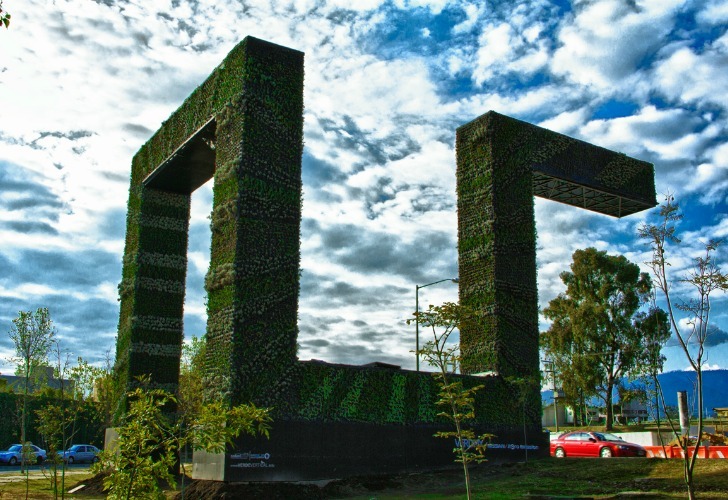 The eco-sculptures can also mitigate Mexico City’s noise an average of 10 decibels. Then there are the advantages that cannot be quantified: improved work performance, comfort and more pleasant scenery at which to gaze from an office window or during a break from work or shopping. The sculptures do not always thrive. The plants that compose the vertical garden on Chapultepec Avenue are not faring so well; most are withered, even though VERDMX selected them because of their hardiness and resistance to vehicle emissions. Not all locals appreciate the effort, and some even view the sculptures as wasteful – an attitude local bureaucrats shared as they took years to approve the project. But since the 1980s Mexico City has shown that it is doing what it can to clean up the city – from a free bicycle loan program to improved transportation and reviving ancient rivers and waterways. VERDMX’s urban gardens are just one visual demonstration of how far the city has come with its sustainability agenda. 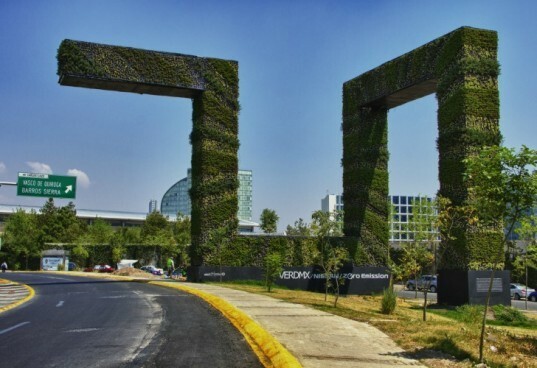 VERDMX has installed three vertical gardens throughout Mexico City that figuratively and literally clean and green this city of 8.8 million. Nissan is sponsoring the three VERDMX installations as part of its "zero emissions" campaign. These eco-sculptures serve as both public art and oxygen replenishers. And VERDMX's work is a leading example of how non profits, businesses and local governments are turning Mexico City into an urban sustainability model to which other developing countries are seeking inspiration. For VERDMX, their vertical garden’s benefits are an easy sell. Each square meter (10.8 square feet) generates a year’s supply of oxygen for one person while removing 130 grams of particulates in the air. A vertical garden on a facade four stories high can filter 40 tons of greenhouse gasses and process 33 pounds (15 kilograms) of harmful heavy metals. According to VERDMX, they also help mitigate noise by 10 decibels. VERDMX touts other advantages that cannot be quantified: improved work performance, comfort and more pleasant scenery at which to gaze from an office window or during a break from work or shopping. Chapultepec Avenue are not faring so well. They often become withered, even though VERDMX selected them because of their hardiness and resistance to vehicle emissions. Since the 1980s Mexico City has shown that it is doing what it can to clean up the city, from a free bicycle loan program to improved transportation and reviving ancient rivers and waterways. VERDMX’s urban gardens are just one visual that demonstrates how far the city has come with its sustainability agenda. They offer a sublime contrast to the city's modern skyline, too.